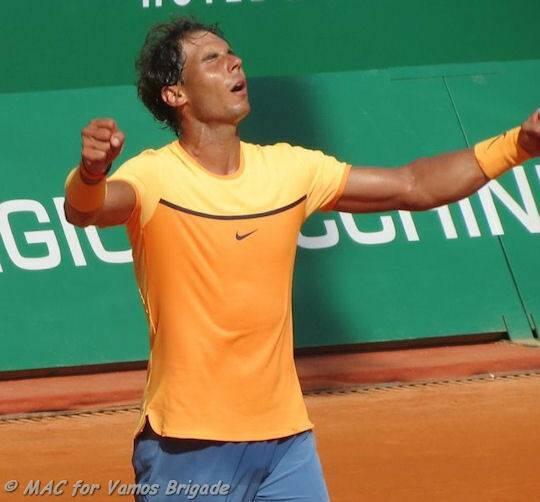 Rafa won his ninth Monte-Carlo singles title on Sunday. It was his 100th final, his 28th Masters 1000 title, his 48th clay court title, and his 68th title overall. 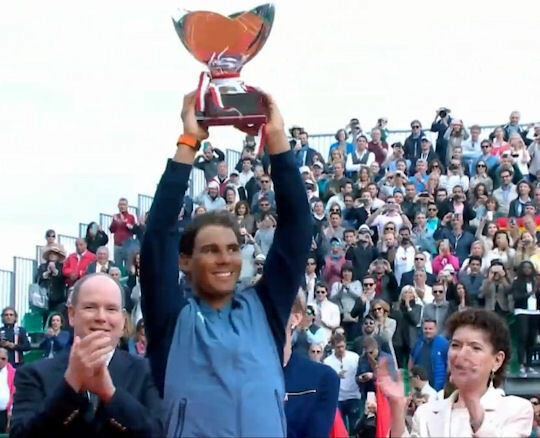 All week long, he had acknowledged that the Monte-Carlo tournament was special to him, and he reiterated that again in his post-championship comments and interviews. This is understandable: Monte-Carlo marks the start of the European clay court "season"; it is where he won his very first Masters title; it is where he had historically started piling up ranking points in the annual "race" to the ATP World Tour Finals; and it is where he won an unprecedented eight straight titles from 2005-2012. 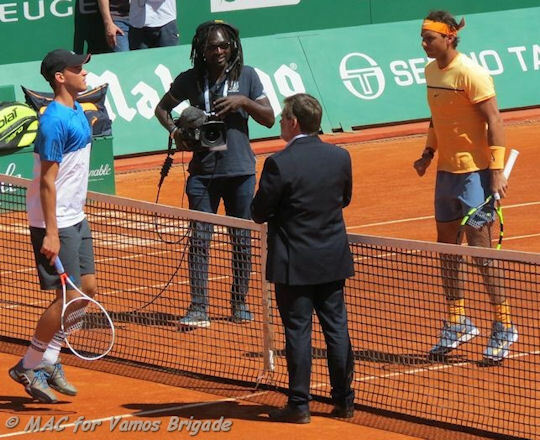 For members of the Vamos Brigade, among the other things that makes the Monte-Carlo tournament special is that a number of VBers attend this tournament every year and share their photos, videos, and experiences with us in vivid, humorous, and fascinating detail. They bring us along with them - to the rented apartments and hotel rooms, the tournament grounds, the practice sessions, the matches, and their extra-tournament activities. So, as I briefly recount Rafa's road to the 2016 title, I will share some of the photos and videos posted by mars06, MadAliceCudlip (a/k/a MAC), and jen. 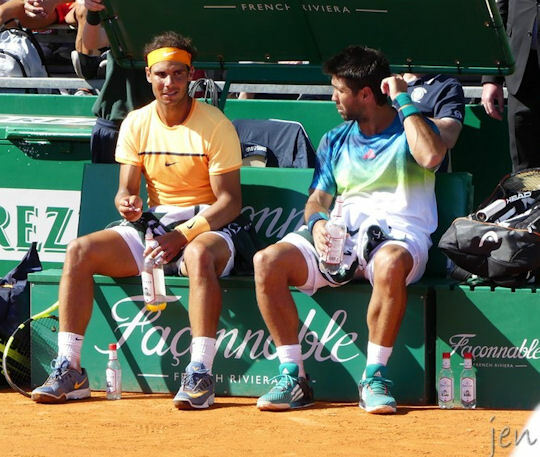 Rafa had entered both the singles and doubles draws this year at Monte-Carlo. He had teamed up again with Fernando Verdasco for doubles and they had won their first-round match against Philipp Kohlschreiber and Viktor Troicki in straight sets, (6-4, 6-2). In singles, Rafa was the fifth seed and had been drawn into the bottom (Andy Murray's) half of the draw. He received a bye in the first round and would defeat Aljaz Bedene, 6-3, 6-3, in the second, on Wednesday. 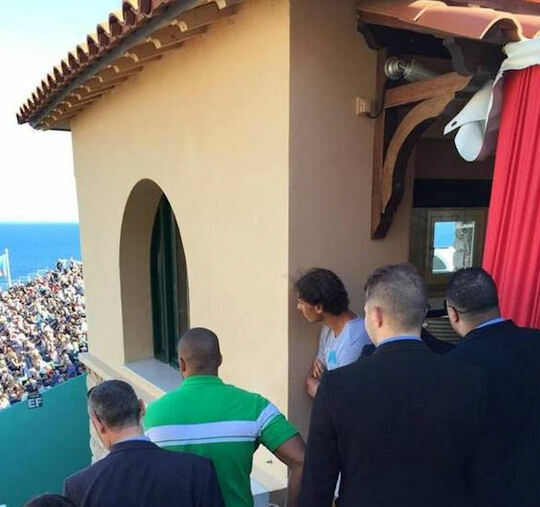 So the VBers who had arrived the weekend before were able to attend several of Rafa's practice sessions (and get serious cardiovascular workouts climbing the countless stairs all over the Monte-Carlo Country Club venue) before Rafa played his first singles match. They were also able, like mars06, to run into Rafa when he was neither practicing nor playing. mars06 found Rafa, after his second-round match, watching Novak Djokovic lose to Jiri Vesely. MAC subsequently photographed forehand and backhands in the same session. I had voiced concern about not seeing Rafa sliding on the clay in the videos MAC and jen had posted. MAC calmed me with proof from another practice session. Rafa's third-round opponent, Dominic Thiem, had evened their head-to-head at one match a piece when Thiem had beaten Rafa - on clay - in the Argentina Open semi final in February. It took Rafa a little over two hours to subdue Thiem in straight sets, 7-5, 6-3, saving a slew of break points, and he seemed relieved to have succeeded in passing that test. Rafa's quarter final opponent was Stanislas Wawrinka. Last year, they had split their four matches evenly, and Wawrinka had defeated Rafa at the same point (the quarter final) in the Rome Masters. Thankfully, Rafa dispatched Wawrinka in straight sets, 6-1, 6-4, in about 78 minutes. Rafa faced Gael Monfils in the final. Their rallies were long and far-ranging. I thought that part of Rafa's strategy was to take Monfils' legs out from under him. They kept exchanging breaks of serve. Rafa took the first set when Monfils double-faulted on a break point. The see-sawing continued in the second set, which Monfils won, but Rafa took control of the third set. When Rafa hit that last forehand down-the-line on match point on Monfils' serve and saw that it was a winner, he sank onto the clay. He won the match and his ninth Monte-Carlo title by the score of 7-5, 5-7, 6-0. 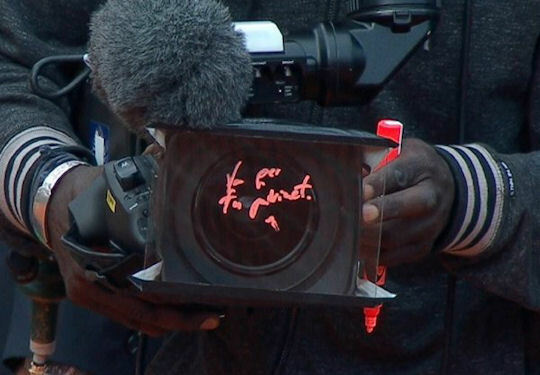 We learned a little after the trophy ceremony, through a tweet with a screen cap by David J. Nadal, that what Rafa had written on the camera lens was, "va per tu padrinet," dedicating his title to his paternal grandfather, who had died within the last year. We all were touched and even happier than before - if that is possible. 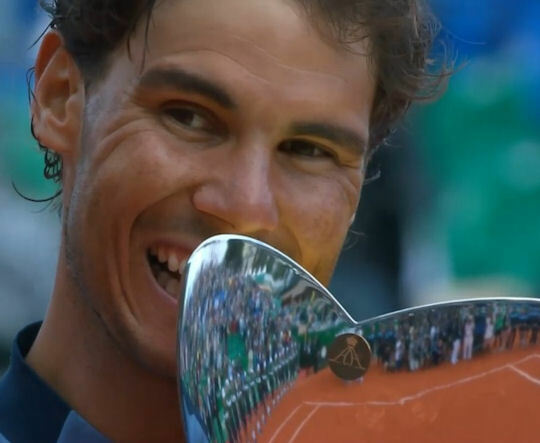 Now we also know another reason that Rafa felt that this tournament was so special. Congratulations, Rafa - your hard work and persistence paid off. I am proud to be your fan and a member of this site.